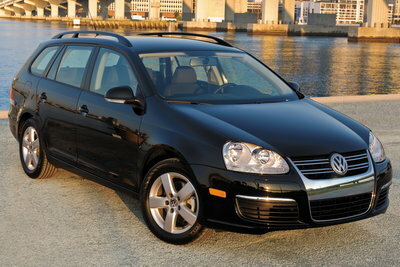 The Jetta Sportwagen replaces the trunk of the Jetta with a large cargo area accessible through a hatch. A cleanly styled interior features a simple and comfortable layout. The standard engine is a 170hp, 2.5L inline 5-cylinder engine with a 5-speed manual and optional six-speed automatic transmission. The SEL model features a 200hp turbocharged 2.0L four-cylinder. The SportWagen also offers a rare diesel engine option. The torquey 2.0L diesel turns in impressive EPA ratings of 30 city / 41 hwy. Those numbers are hard to match in any other car with the utility. The Jetta is in general a good value, but at the upper end of the model range, the roomier Passat becomes a very attractive alternative. The Jetta hasn't offered a wagon version since the last redesign in 2006. The SportWagen (Golf Variant in other markets) replaces the trunk of the Jetta with a large cargo area accessible through a hatch.